Foundry Motorcycle in Chichester have built a couple of really nice Beemer customs recently, and they have an unenviable task making a Boxer twin stand out in the UK, (where flat twins seem to be everywhere), but not only is this bike a well-proportioned quality custom, it also has a few unique features, most notably that pipe, which runs through the back of the seat. We’re told it’s extremely well insulated. …The bike certainly impressed the visitors at last October’s Bike Shed exhibition, in a see of BMWs. The donor bike started life as a 1981 BMW R80 TIC which was purchased via ebay from a guy in East Sussex who is one of Lord March’s personal drivers. We’d been looking for a suitable BM donor for a while and Tom ended up with three in the space of two weeks. 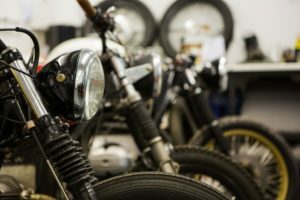 Originally the bike was being put together as Tom’s daily ride but it was spotted whilst on display at this years Goodwood Revival by Carl who patiently waited for it to be finished, then promptly came and whisked it off to join the rest of his fine bike collection. 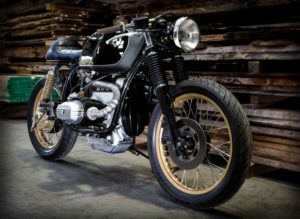 In 2006 Tom’s brother was wandering around Barcelona when he spotted a very cool looking R80 parked amongst the rest of the bike chaos and emailed Tom a photograph. 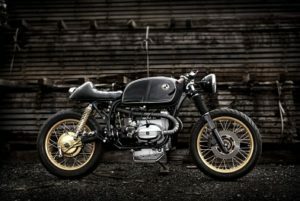 At the time, it was completely unlike any other Beemer he’d seen, clubman bars, pod filters, single seat and some other neat touches, Tom instantly fell in love with the overall style and decided he had to build something with a similar character. The picture was regularly talked about, but it took six years to finally get round to the build. After looking at the original photo many, many times, it was decided that the Foundry bike needed to be a little more refined. So, after the initial ‘strip down’, a new rear subframe was created to work with a shorter seat, then an up and over exhaust followed, but that couldn’t be the same as anybody else’s! Exit through the upholstered seat rather than under or around it seemed a pretty fresh approach and a quick mock up looked great. Tom also had a real bee in his bonnet about fork clamp mounted headlights, so decided to create an extended fixed headlight frame, which gives the front of the bike great attitude. 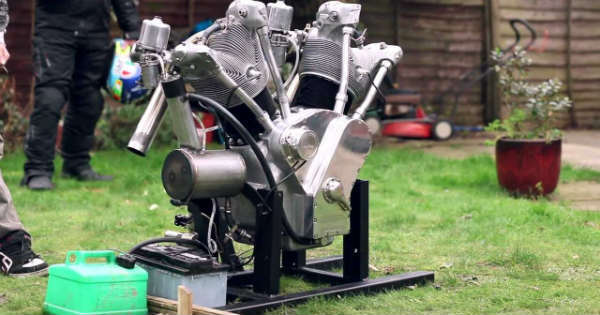 THE “FLYING MILLYARD” 5 LITRE V TWIN – FIRST TEST RUN! 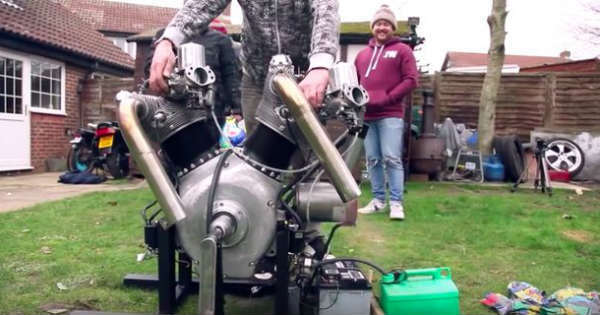 Homemade 5 Liter V-Twin Engine!!! Home made insanity at its finest. The recipe for this one is quite simple, you take two Pratt & Whitney R1340 aircraft cylinders, align them in a V configuration and you get a homemade 5 Liter V-Twin. The rest of the build was managed by these guys who made custom crankshaft, connecting rods and the other moving parts. Considering how precise these moving parts need to be then the machining skills and manufacture skills that these guys have, this is really impressive. 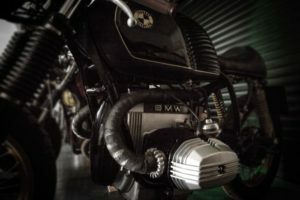 In order to run the engine dry sump, they installed two oil pumps, and continued with twin SU carburetors manual advance and retard, points ignition and for bigger boom they installed two spark plugs per cylinder. Now the question we have to ask you is what would you power with this monster? 1949 Chevrolet 5 Window Pickup “Heirloom” 2017 Great Eight Winner 2017 Detroit Autorama! It’s been a while since we have featured Scottie from the famous YouTube channel, ScottieDTV and we have said it many times before, this guy knows how to admire a car and he knows how to choose an awesome vehicle. 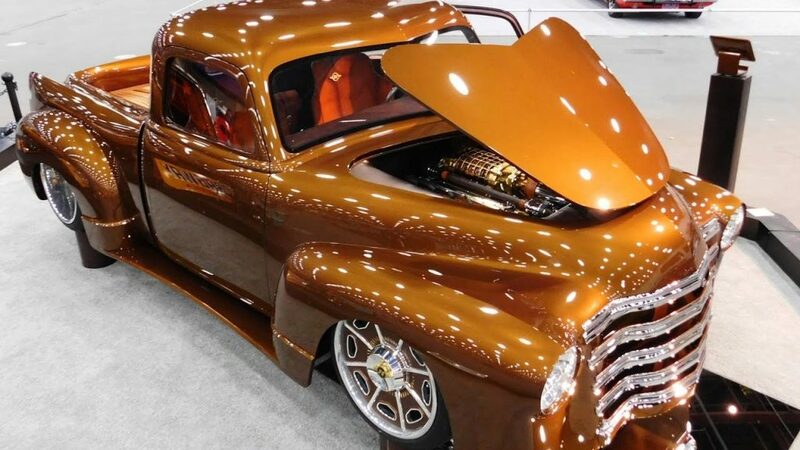 This time he shows us an astonishing 1949 Chevrolet 5 Window Pickup Custom “Heirloom”, and you have to admit, this is one of the most beautiful pickups you have ever seen. 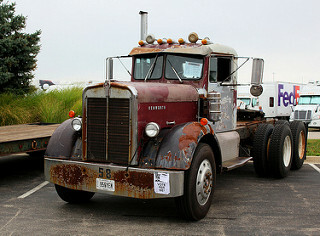 The ride has been filmed at the 2017 Detroit Autorama, and you bet that it was one of the Great Eight winners at the show, and this comes as no surprise at all to anybody. 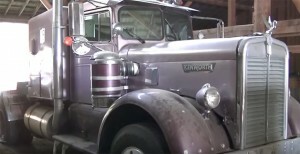 The whole vehicle is a combination of the most elegant pieces of automotive history, like the ’39 Model A headlights, a stunning flush-mounted windows, rear body panel that once belonged to a ’55 Cadillac Fleetwood, and many many more. Riding on a Corvette C5 chassis and powered by a LS1 engine, this is one vehicle that just has to be seen, so play the video and tell us, is this the best-looking vehicle of its kind ever?